A CRIME and a lie are the twin strands in the shameful tragedy of Katyn: the massacre of 20,000 Polish officers by the Soviet secret police, and the cover-up that followed. Now Andrzej Wajda, Poland's leading film maker, has made his last film (he is 81) about what he calls the “unhealed wound” in his country's history. Mr Wajda's own father, Jakub, was murdered at Katyn, as were family members of many of the production team. Those killings come in a gruelling, 15-minute final sequence. First, the film shows in sombre and claustrophobic detail the Polish POWs' travels to Golgotha; the occupation authorities' vengeance on their families, and flashes forward to the attempts by the country's post-war rulers to disguise and deface the historical record. Expert cinematography, compelling acting, and a story that leaves the viewer both sorrowful and angry, are a strong combination. But they may not be quite enough to convince the judges. “Katyn” is filmed from an uncompromisingly Polish point of view. Some outsiders may find it confusing. One of the most powerful scenes, for example, is the mass arrest of the professors of Cracow University by the Germans. Those who already know about the upheaval that followed the German invasion of 1939 will see the point: the Soviets and the Nazis were accomplices. Others may puzzle. The moral dilemmas of post-war Polish collaborators are better portrayed than those of the wartime occupiers. If honouring the dead means doom for your family—or for you—is it better to keep silent? Poles faced that choice again and again after 1945, as their new rulers used Katyn as a litmus test of loyalty. But barring one Red Army officer, impeccably played by a Ukrainian actor, Sergei Garmash, who saves his neighbours (an officer's widow and child) from deportation, the foreigners are so villainous as to be little more than sinister mannequins. Melodrama is perhaps one fault of the film; an oddly sanitised picture of daily life is another. Teeth, complexions and clothes all evoke the prosperous Poland of today more than the squalor and hunger of 1945. Material deprivation brings out the worst and the best in people. But it needs to be shown to make the measure convincing. Astonishingly, some in Russia are now reviving the lie that the murderers at Katyn were not by the NKVD, but the Nazis. That was maintained during the communist era, but only by punishing savagely those who tried to tell the truth. Last year, as Mr Wajda's film opened in Poland, a commentary in a Russian government newspaper, Rossiiskaya Gazeta, dismissed the evidence of Soviet involvement in Katyn as “unreliable”. An Oscar would be a good answer to that. EUROPEANS may not always like it, but America still matters most for their security. As Kosovo edges towards independence, NATO ponders further expansion and Russia rips Europe's threadbare energy policy to rags, every debate involves America. And the mood is gloomy. “Russia is getting stronger; we are getting weaker”, concludes one European political leader. That is alarmingly clear in Serbia, where a pro-Russian nationalist, Tomislav Nikolic, came out ahead in the first round of the presidential election on January 20th. Serbia has just signed an energy pact to distribute Russian gas exports to Europe; in return a Russian company (the oil arm of Gazprom, the state-run gas giant) is to get a controlling share in Serbia's national oil monopoly. Europeans flinch at the idea of Kosovo, the mostly ethnic-Albanian province of Serbia, declaring independence immediately—something the Russians strongly oppose. The Americans fear that more delay risks violence by impatient Kosovars or by Serb provocateurs. Some Europeans plead for a few weeks longer, perhaps to allow yet more talks with Serbia after its presidential election, or simply to get more European waverers such as Spain and Romania to back European Union recognition of an independent Kosovo. Serbia is one of what some analysts call “swing states”, places where Russia and the West are vying for influence. Others include Ukraine, Georgia, Azerbaijan and Moldova—and even a few EU members such as Latvia and Bulgaria. President Vladimir Putin of Russia, accompanied by his likely successor, Dmitry Medvedev, recently signed a deal with Bulgaria to build a new pipeline across the Black Sea. Called South Stream, this will pipe Russian gas direct to Europe, bypassing transit countries such as Ukraine and Poland. In this, it matches Nord Stream, a similar bypass under the Baltic (see map--on economist.com). South Stream may stymie a rival EU effort, Nabucco, which was meant to bring gas from the Caspian and Central Asia to western Europe through the Balkans. Nabucco would be the only pipeline from the region not to cross Russian territory, giving Europe the hope of more diversified gas supplies. Nabucco's prospects already looked shaky: gas for it must come from either a trans-Caspian pipeline (which Russia has blocked) or Iran (which America dislikes). If South Stream were built, it would make Nabucco uneconomic. Pipelines and dependence on Russian gas are not the only sources of controversy. American and European diplomats are also wrestling with the question of NATO expansion, which may feature at the alliance's summit in Bucharest in April. The leading candidate is Croatia. Albania and Macedonia are less prepared, but bringing them in might be seen as one way of countering instability caused by Serbia's hostility to Kosovo's independence. That leaves Ukraine, whose new government says it wants eventually to join NATO, and Georgia, which tarnished its democratic credentials in a crackdown on opposition protests in November. Offering either country a membership action plan—a staging post to joining the alliance—would enrage Russia. But holding back might be seen as giving the Kremlin a veto over its neighbours' security arrangements. The hunt is on for something else to offer instead. Largely silent is the EU, whose members appear more concerned over institutional reform and emissions targets (see article) than geopolitical issues. That worries the Americans. They seem to have settled a row with Poland over a planned missile-defence base. But not much else is going right. Ron Asmus, a former American diplomat now at the German Marshall Fund, a think-tank, frets publicly about a “rollback” of the West's influence in eastern Europe. He is not the only one. IT WOULD be nice to think that the harassment of the British Council by the Russian authorities would prompt a united, imaginative European response. Perhaps in a parallel universe it is. Imagine Germany’s Goethe Institute, the Spanish Instituto Cervantes, the Institut Français and other Western cultural-diplomacy offices announcing joint efforts to promote the English language and British culture and hire all the staff of the British Council offices. That would force the Kremlin to decide whether it really wanted a full-scale confrontation with its most important neighbours. Such a stance would prove beyond doubt the need for a serious rethink. If Russia backed down, the row would end. In this universe, though, the response has been feeble, and not for the first time. When European countries have tiffs with the Kremlin, they tend to find themselves standing alone, not shoulder to shoulder with their allies. In Britain’s case, that is partly the fault of the prime minister, Gordon Brown, whose hermit-like approach to Europe has won him few friends. A man who won’t even come to the phone when the French and German leaders want to talk to him can hardly expect their instant help when things get tricky. But it also reflects Russia’s remarkable ability to strike bilateral deals. Every European country has its own agenda—perhaps the prospect of cheap gas, perhaps the chance of a lucrative investment in Russia’s booming economy. Such considerations tend to override any other concerns. The overall result is dismal. Russia tends to put countries in one of three categories: those it flatters, those it squeezes, and those it ignores. Countries can be switched with remarkable rapidity. Slovakia, the Czech Republic, Slovenia and Romania are, for now, in the “ignore” category. Estonia and Lithuania, as well as, most of all, Britain, are in the “squeeze” category. France, Germany, Italy. Bulgaria and Poland are, for now, in the “flatter” box. Latvia was there too—but this week’s news of the expulsion of a Russian embassy official, supposedly caught red-handed trying to bribe local public servants, may change things. The result is a kind of diplomatic ratchet, which goes in one direction only. That suits the Kremlin fine—it doesn’t need to be friendly with all European countries, just enough to prevent any united European policy emerging. And when relations are good, Russia makes real gains—such as the recent energy deal with Bulgaria. Vladimir Putin, accompanied by his successor-designate Dmitri Medvedev, visited there last week and signed a deal on the South Stream pipeline. This puts the kibosh on European hopes of building Nabucco, which could—if everything else went right—bring gas from Azerbaijan and elsewhere to European markets, without crossing territory under Russian control. With Russian deals done or looming in most of the countries that Nabucco is supposed to cross, the project looks moribund. Perhaps in the parallel universe things are different: European countries could react to the South Stream deal by telling Russia that unless it signs the energy charter and demonopolises its pipelines, Europe is both going ahead with Nabucco and building a bunch of terminals to import liquefied natural gas. They could also synchronise their counter-intelligence work. Instead of dealing with Russian spies piece-meal, they could organise a joint expulsion: say four from each country, announced at the same time on the same day. That would send a sharp signal to the Kremlin spymasters that their efforts were attracting seriously unwelcome attention, not just bouts of irritation. Europe collectively is much bigger, richer and stronger than Russia. You wouldn’t know it from reading the news—in this universe at least. Pawel Zalewski and Charles Grant discuss Poland's foreign policy. Last week it was Georgia's turn. You can hear an interview (on a rather crackly phone line) with Mikheil Saakashvili and a discussion of Georgia's prospects. We aim to interview a big name roughly every week. Feedback and suggestions welcome! WHAT should the West think about Russia? That is the subject of a powerful new study by James Sherr, a senior lecturer and fellow at the Defence Academy of the United Kingdom, Britain’s military think-tank. Released this week, as Britain tries to keep its cultural-diplomacy offices in Russia open in the teeth of intimidation and official displeasure, the paper is highly topical. The Kremlin, Mr Sherr argues, is not reviving the cold war, but pursuing a hard-headed realpolitik. That has replaced the post-cold war partnership developed in the 1990s, which Russians believe was founded on their own disorientation and weakness. Russia will now exploit the West’s weaknesses and mistakes, and compete for power and influence where it can. That will continue so long as Western divisions and dependence encourage the Kremlin’s strong-arm tactics. It won’t improve in the short term: the Russian political system is designed to discourage voices of moderation and cooperation. But in the long run, Russia is “underestimating its own shortcomings,” he argues, as well as the West’s potential leverage. The picture may look bleak, in short—but only so long as we let it seem that way. Is Mr Sherr right to say that there is no new cold war? It hangs on definition. He argues that the three main elements of the old cold war—ideological, military and global confrontation—are now missing. “Russia is aggressively ideological about its sovereignty, but in other respects cynically ‘pragmatic’”. Perhaps. But the promotion of Soviet-era myths, xenophobia and nationalism, plus the sanitisation of Stalinism in officially sanctioned textbooks has more than a whiff of ideology. Military power certainly takes a back seat compared to its prominence at the height of the cold war. The resurgence in Russian military capability is a long way from matching the Soviet arsenal. But arms sales to countries such as Iran, China and Syria give teeth to Russian foreign policy. The Russian navy—now making a much publicised return to the blue waters of the world’s oceans—may be ineffective in a real fight because of its lack of air cover. But even a symbolic presence can raise the stakes, especially against indecisive or timid opponents. What is certainly true is that the Kremlin is no longer a global adversary: its relations with the Muslim world and China, are tetchy and ambiguous. But the lack of a global dimension doesn’t make the tussle for power less troubling in the main theatre of the old cold war—the countries stretching from the Baltic to the Black Sea. Clearly the icy and terrifying confrontation of the 1950s and 1960s is not in view. But that era shaded into détente—what some have called the “soft cold war”. Finding similarities between that era of uneasy coexistence and our own is perhaps easier. But whatever the new era is called, the big question is what to do about it. Mr Sherr recommends patience and resolve. 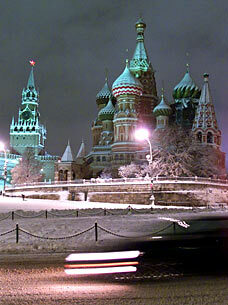 Russia will not lightly abandon the course it has set over the past decade. As in Soviet days, contradictions will be the Kremlin’s downfall: perhaps frustration with bureaucracy and bad government, perhaps growing energy shortages, perhaps open feuding at the summit of power. These may eventually turn public opinion and even officialdom towards real integration with Europe. Don’t hold your breath. Copyright © 2008 The Economist Newspaper and The Economist Group. All rights reserved. 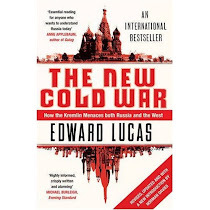 By EDWARD LUCAS - Few things embodied Stalinist terror more than the midnight knock on the door. For millions of innocent victims it heralded interrogation, torture and a lengthy - and all too often lethal - sentence in the Communist concentration camps of the Gulag. Now the heirs of Stalin's secret police are running Russia - and there could be few clearer signs of their true nature than the British Council's Russian staff being hauled from their beds to answer for the "crime" of working for a foreign employer. The harassment of the British Council on transparently bogus charges of tax evasion has prompted a protest even from our supine Foreign Office. The extraordinary thing is that Vladimir Putin hardly seemed worth a footnote to Russian history when the ailing Boris Yeltsin named him Prime Minister in 1999. Few realised that the taciturn bureaucrat with a taste for judo was the harbinger of a silent putsch that would put the old KGB in charge of the Kremlin, with chilling consequences not only for Russia, but for the world. The "siloviki" (literally "men of power"), as the spooks are called, have transformed Russia. They took over a pluralist country with a lively Press and strong pro-Western orientation, though still reeling from the Soviet economic collapse and the looting and corruption that followed it. Many at home and abroad hoped that a few years of heavy-handed rule by sinister strongmen would be the price of freedom and security. They were wrong. The costs of Putin's KGB putsch have been colossal. Russia today is the epitome of bullying and crookedness. The independent media have shrivelled, with television in particular coming almost completely under the authorities' control. Almost every channel for complaint and dissent is blocked. Judicial and bureaucratic harassment, as well as physical threats, deter all but the bravest from speaking out. The authorities increasingly use forcible incarceration in psychiatric hospitals, the most loathsome weapon in the Soviet arsenal of repression, against their critics. No wonder most international rankings no longer count Russia as a "free country"; no wonder they now list it as one of the most corrupt in the industrialised world. That is a shameful retreat from the hopes of the 1990s. Yes, living standards in Russia have soared under Putin, and most Russians believe they are living in a golden age. This is hardly surprising, given that the price of oil - a resource the country has had in abundance - has risen some five times since Putin came to power. And in a country where the media has been annexed for pro-Putin propaganda, is it not understandable that his regime has popular support? In truth, Russia is being run by a corrupt, incompetent and despotic regime, and the huge windfall of high oil prices is being squandered. Now is the time to modernise Russia, using the vast influx of petro-roubles, but there is no sign this is happening. The oil and gas will not last for ever - their production is flat or falling and Russia is suffering power shortages; public services are a disgrace and the infrastructure pitiful. Grand plans are everywhere: Russia says it will spend a trillion dollars on public investment projects in the coming years. But the evidence so far is that this money is at best stolen, and at worst simply wasted. After eight years of Mr Putin's rule, there is little improvement in roads, railways, power stations and pipelines. Abysmal standards of public health, dangerous workplaces, endemic alcoholism and dreadful road safety make male life expectancy only 58.6 years - worse than in Laos or Yemen. The so-called golden age is as phoney as Russia's elections that put Mr Putin and his cronies in power time after time. When his hand-picked successor Dmitri Medvedev "wins" the presidential election next month, the nameplates on the doors may change, but the political system Mr Putin and his fellow siloviki has created will stay: impenetrable to outsiders, impervious to criticism and lubricated with vast sums of money obtained corruptly. 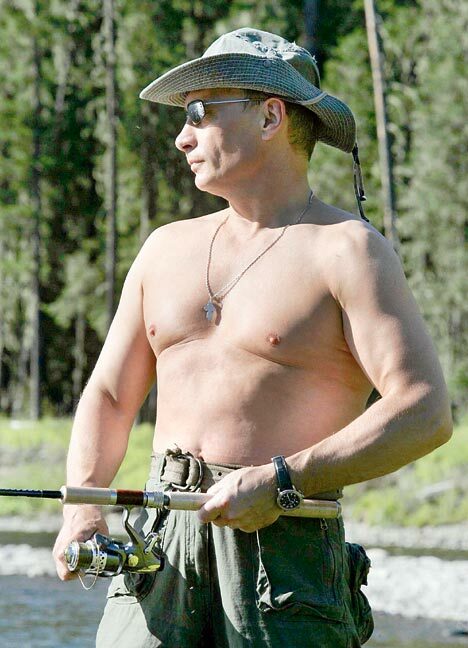 Mr Putin is reckoned to be worth $40 billion. One source of this cash - though denied by all concerned - is an extraordinarily profitable Swiss-based oil trading firm that seems to have the miraculous knack of gaining almost limitless supplies of cut-price Russian crude oil to sell on the world market. True, the oil and gas have fuelled a remarkable boom in construction and retailing. Glitzy malls and towering skyscrapers are sprouting up across Russia. But the boom is fuelled by natural riches, not brainpower. Bright Russians with good ideas need the certainty provided by honest courts and solid property rights, and go abroad to find them. Mr Putin talks of a "dictatorship of law" - but it is dictatorship, not justice, that has been the reality. The KGB regime in Russia is more than just a missed opportunity; it is also a direct threat to us. The best example of this came with a shameless act of nuclear terrorism in the heart of London barely a year ago. Alexander Litvinenko was a strident London-based critic of Mr Putin, accusing him of everything from mass murder to paedophilia. Poisoned with a rare radioactive isotope, polonium-210, at a meeting with three Russians at the Millennium Hotel, this British citizen died an agonising death; his last words directly blamed Mr Putin for his murder. Had the assassins come from any other country claiming to be an advanced European democracy, this would have led to intensive - and successful - cooperation between Scotland Yard and the foreign criminal justice system. Whether or not the murderer was extradited, he would certainly have been prosecuted. At the very least, careless handling of toxic radioactive substances is a crime and Andrei Lugovoi, the man British officials have named as their prime suspect, left a trail of polonium in his travels across Europe. 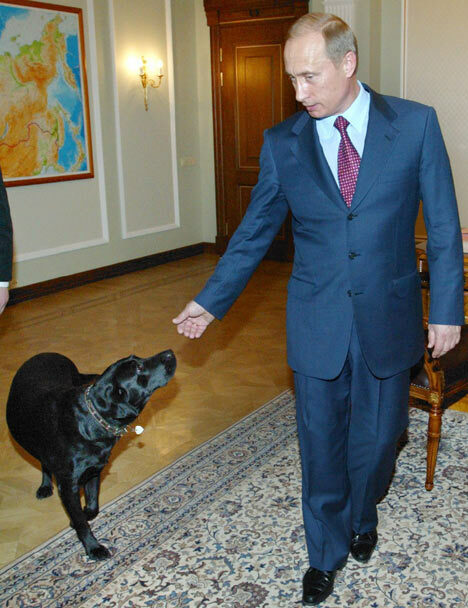 But Mr Lugovoi enjoys Kremlin protection at the highest level. Despite having endangered scores, if not hundreds, of innocent Londoners with his antics, he has faced no penalty. Indeed, he has been feted in Russia, becoming a celebrated politician. The Kremlin scoffed at British concerns: why would London jeopardise important trade relations "for the sake of one man", a foreign ministry spokesman asked. Some 20 years after Mikhail Gorbachev started dismantling Communism, Russia is reverting to Soviet behaviour at home and abroad. Thanks to billions of pounds in oil and gas revenues, the Kremlin can afford to be contemptuous of our values. So far our response has been perilously inattentive and complacent, partly due to greed and wishful thinking, and partly because of distractions. European countries have been so preoccupied with their distaste for George Bush's "war on terror" that they have all but ignored the threat from Russia. Those who downplay the threat say that elements of a new Cold War are missing. That featured a global military and ideological confrontation, when a surprise conventional attack in Europe by the Warsaw Pact could have reached the Rhine within three days, forcing the West to choose between surrender and starting a nuclear war. Half the European continent was under the ice cap of Communism, with even the most fleeting human contacts constrained by the climate of fear. That Cold War is indeed over: I remember it when it was alive and - as a correspondent in Eastern Europe as Communism collapsed - I was there at its funeral. But so too are the rosy sentiments that succeeded it. The most catastrophic mistake the outside world has made since 1991 is to assume that Russia is becoming a "normal" country. From this Panglossian viewpoint, any problems that arise are mere bumps in the road that will be left behind in the progress towards Westernstyle freedom and legality. That idea always seemed optimistic, but now it looks downright fanciful; those who advocate it are deluding themselves and those who listen to them. Russia still, outrageously, belongs to the G8 club of big rich Western countries and the Council of Europe, a talking shop that also guards the continent's human rights conventions. But that should fool nobody. Russia has explicitly abandoned Western values of political freedom, the rule of law and multilateral security, in favour of its own ideology, "Sovereign democracy". That is a mixture of xenophobia, nationalism, autocracy, self-righteousness and nostalgia for the Soviet - and Stalinist - past. Gangster capitalism is not international Communism. But it is still a fundamental threat to our political and economic system. It is true that despite the colossal increases in its defence budget, the Kremlin is not yet a direct military menace to the West. Russia's newest warplanes may be formidably manoeuvrable, its submarines super-silent, its torpedoes terrifyingly fast, but it has not - yet - been able to produce these weapons in any quantities. Its surface navy is a pathetic relic, with barely 20 seaworthy big ships. Two-thirds of Russia's nuclear missiles are obsolete. But the Kremlin is a menace in a different way. It sells advanced weapons to dictatorial and anti-Western regimes. The Shkval [Squall] torpedo, for example, is an underwater rocket that creates a cone of water vapour enabling it to travel very fast. It is one of the few weapons that can sink an American aircraft carrier. Russia has sold that technology, Western spooks fear, to Iran. Its air defence systems are better than America's Patriot missile. As the Kremlin exploits Western disunity and weakness all over the world, arms sales give it teeth. Yet high explosives, hardened steel and enriched uranium are still a sideshow. The New Cold War is fought with cash, natural resources, diplomacy and propaganda. Having cast off the dead weight of ideology, the former KGB men in the Kremlin are presiding over a Russian Klondike, a source of irresistible temptation for greedy outsiders. Russia is exploiting the West's increasingly desperate shortage of energy. We in Europe face growing dependence on scanty and expensive Russian gas, with little chance of alternative supplies. The Kremlin wields the energy weapon to bully its enemies and bribe its allies, and uses its financial clout to buy friends and influence. The big strategic worry used to be the Soviet navy's capacity to blockade Europe's sea lanes. Now it is Gazprom's ability to blockade its gas pipelines. Once it was the Kremlin's tanks thundering into Afghanistan that signalled the West's weakness; now it is Kremlin banks thundering through the City of London. The growing business and financial lobby tied to Russia represents a powerful fifth column of a kind unseen during the last Cold War. Once it was Communist trade unions that undermined the West at the Kremlin's behest. Now it is pro-Kremlin bankers and Western politicians who betray their countries for 30 silver roubles. Western investment in Russia has already created a lobby for good relations with the Kremlin in the City, in German big business and in the energy industry across Europe. That is reinforced by the billions of dollars of Russian investment pouring into Western Europe and North America. When Russian tycoons — who these days run their businesses at the Kremlin's bidding — own big stakes in the West's biggest companies, they are no longer outsiders, but insiders. Russia is becoming a giant nucleararmed version of Saudi Arabia: a country so rich and powerful that even its support for terrorism does not bring Western disfavour. The main battleground so far — and one where the West is losing hands down — has been in the once-captive nations between Russia and the rich half of the continent. 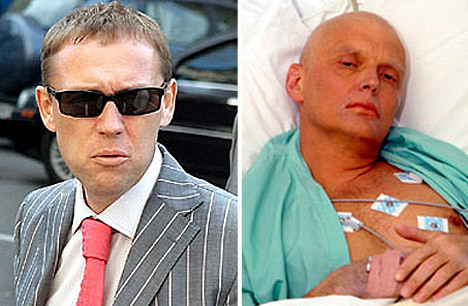 Row: Anglo-Russian relations have deteriorated over Moscow's refusal to extradite ex-KGB officer Andrei Lugovoy, left, wanted for the murder of Alexander Litvinenko (right). Russia makes no secret of its desire for a dominant say-so in its former empire: it wants to know everything that happens and to have the power to stop what it does not like. For its neighbours, Russia is like an aggressive man on crutches — no threat to the ablebodied, but still a menacing bully for someone in a wheelchair. That means a tussle in Central Europe, the Balkans and the Caucasus, and particularly in the Baltic states of Estonia, Latvia and Lithuania. They are the Soviet satellites whose loss the Kremlin resents most sharply. Their thriving economies and lively, open societies are a constant and glaring contrast to the authoritarian crony capitalism across the border. Russia is putting the Baltic states under an energy squeeze, cutting off oil supplies to Latvia and Lithuania. It has incited riots in Tallinn, the Estonian capital. It has abandoned Yeltsin's policy of historical reconciliation. The Kremlin's line now is that the Soviet occupation of the Baltic states in 1940 — part of the shameful Hitler- Stalin pact — was legal. That should come as no surprise: Mr Putin, who says the collapse of the Soviet Union was the "greatest geopolitical catastrophe" of the 20th century, believes the history books written in the Yeltsin years paint the past in too bleak a light. The strangest feature of all this is the West's unwillingness to admit what is happening. Officials and politicians ask haplessly: "If Russia is a political menace again, what on earth are we supposed to do about it?" The old Cold War imposed a demanding regime of mental and moral toughness on the countries of Western Europe: they knew that if they did not hang together they would hang separately. Now the Kremlin's central tactic of "divide and rule" has an almost free run. During the old Cold War, no NATO member would have considered doing private deals with the Kremlin: any overtures from the Soviet Union encountered hard-headed scrutiny, while few in Western officialdom made a career out of being nice to the Soviet bloc. Anyone in the business world who made a profit out of dealings with Communist countries was an instant target of suspicion, and risked ostracism. In the New Cold War, such deals are commonplace — most ominously in the big countries of continental Europe. Russian money and influence has reached astonishingly far. Few would have believed that a former German leader, Gerhard Schröder, would have taken a lucrative post as chairman of a Kremlin-backed gas venture within months of taking [subbing error: should be leaving-EL] office. It took the West 30 years after the Bolshevik Revolution of 1917 to realise the threat it faced from the Communists in the Kremlin. How long will it take us to see the danger now that the most sinister force in the Soviet Union — the KGB — is using our own weapons against us? HOW well is eastern Europe placed in an era of global tightening? At first sight, it looks grim. The region has worrying imbalances at a macro level, and over the past ten years has failed to reform sclerotic public administration, calcified higher education, and congested infrastructure. Only flyweight Slovenia has joined the euro, and the “halo effect” created by the expectation that others will join soon is fading. Past slowdowns in the rich world have had disproportionate impacts in the ex-communist countries. In 2001, for example, GDP growth in the EU-10 (now the new members of the European Union) came crashing down to barely 2%. A new paper from Capital Economics, a London-based consultancy, tackles this question head on. The first point is that though the region’s economies are heavily dependent on exports (which make up 76% of Slovakia’s GDP, for example) they are well-shielded from any recession in the United States. Exports to the euro zone range from 40% of GDP in Slovakia to 7% in Latvia. Exports to America are in single figures—usually 1-2%. Even if old Europe grows at only 2% next year, it argues, the EU-10 can expect growth by at least 4%. That may feel like a hard landing compared to the likely year-end growth figure for 2007, which was around 6.5%, but it is still respectable. Hungary, the Czech Republic and Poland can still expect double-digit export growth. Foreign investment of $350 billion since 2000 in the region has created a mighty engine of modern business in what are still attractively priced, politically stable countries close to rich-country markets. Russia helps the region too. A boom there—mostly but not solely fuelled by high energy revenues—is sucking in both consumer and investment goods. A planned $1 trillion public investment programme over the next decade may be mostly stolen or wasted. But the pickings for outside contractors with the language and cultural skills needed to navigate the Russian business environment will be rich. The third and largest worry is huge current-account deficits, particularly in the Baltics and some Balkan countries. But so long as the foreign banks continue to stand behind their local subsidiaries, a soft landing (except perhaps for property speculators) still looks likely. Wild talk last year of devaluation and credit crises in the region has so far proved just that. The big question is really political, not economic. No government in the region combines economic vision with both political grip and integrity. Ferenc Gyurcsany’s government in Hungary has done remarkably well in bringing that country’s public finances back from the brink, but has flinched at real reform of the public sector. In most other countries, the government does little more than mind the shop. The exception may be Poland. Though the new government is having a quiet first 100 days, businesses seem to like what they see. An international ranking of the business outlook compiled by Grant Thornton, an accountancy firm, shows soaring optimism among Polish businessmen, who are now the most confident in all Europe, and are beaten in the global ranking only by five Asian countries. That’s encouraging—although it may have as much to do with frustration with the sleaze and circuses of the past, than with deep enthusiasm for the present government. The launch of the "New Cold War" is looming and a number of events will take place in London (Feb 4) , Oxford (Feb 7), at Washington DC (Feb 17-20), New York (Feb 21-23) and Boston (Feb 24-25). Some of these are public, for example at Politics and Prose in Washington on Sunday 17th February at 1700. Others--for example at thinktanks and universities--may require registration. Anyone who reads this blog and enjoys it, and who would like to come is welcome to email me, preferably giving a brief indication of who they are as well as what day and city interests them. I will then hope to get everyone on the appropriate guest list. Man of the year, or scandal of the decade? CHOOSING a “Man of the Year” is a risky business and writing about him even more so. Take this sentence: “His was no ordinary dictatorship, but rather one of great energy and magnificent planning.” It is a fair bet that by 1941, the editors of Time magazine regretted this description of Adolf Hitler, used in “Hymn of Hate”, a (largely negative) cover story that celebrated his crowning as 1938’s “Man of the Year”. 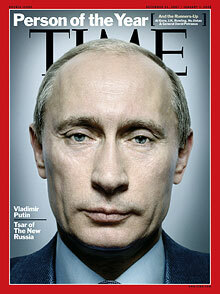 Now Vladimir Putin is Time’s “Person of the Year” for 2007: not an honour, the magazine insists, but just a recognition of “bold, earth-changing leadership”. Even so, that is hardly future-proof. Russia’s still-shaky economy and disastrous demographics mean that rather than being the harbinger of Russia’s stability-based revival, as Time predicts in a cooing article it cheekily titled “A Tsar is born”, Mr Putin may be seen as the mortuary assistant who presided over the greatest missed opportunity in its history. Even without endorsing Mr Putin’s rule outright, Time largely swallows the Kremlin’s version of Russia’s past and present. Yet as Michael McFaul and Kathryn Stoner-Weiss point out in the latest edition of Foreign Affairs, it is far from obvious that autocracy has been good for Russia, either in economics or in the growth of modern, efficient and accountable state institutions. Russia’s economy is certainly doing better now than in the 1990s under Boris Yeltsin, but any comparison based on that must also include the wildly different starting conditions and external environments. “Even in good economic times, autocracy has done no better than democracy at promoting public safety, health, or a secure legal and property-owning environment,” they note. Russia’s economic history lends itself to sharply different interpretations. An excellent recent book by Anders Aslund, “Russia’s Capitalist Revolution: Why Market Reform Succeeded and Democracy Failed”, gives Mr Putin and his team high marks for their economic policy in the early years of his rule, particularly the unglamorous but vital fiscal reforms of 1999-2001, which ended an era of chaos in Russian public finances. But Russia’s recent political history tends to attract criticism from all corners. The audible but mostly invisible feuds inside the Kremlin, and the total secrecy about political decision-making, make even the stability so praised by Time look precarious. Even Mr Putin’s biggest fans would find it hard to argue that he enjoys a robust debate with critics, or promotes a fastidious separation of business and political interests. He has also a troubling habit of dissembling when faced with awkward facts—claiming, for example, that the state had nothing to do with the onslaught on Yukos, the energy company owned by Mikhail Khodorkovsky, an anti-Kremlin tycoon. Mr Aslund says of this episode that Mr Putin, Soviet-style, “re-established the public lie” as an official standard. The Time journalists avoided calling Mr Putin a liar, though they clearly struggled to like the man they interviewed for more than three hours. They politely bemoan his humourlessness, rudeness, and “vein-popping” short temper, and note that he left abruptly and without explanation, with his dinner just half-eaten. They signally failed to confront his absurd equation of America’s deplorable electoral hiccoughs with the Kremlin’s crushing of its political opponents, or Mr Putin’s slanderous attacks on the opposition leader, Garry Kasparov, or his brazen evasion of allegations about corruption in his inner circle. And how come Mr Putin demands strict non-intervention from other countries when it comes to Russia, but shows no such restraint when the Kremlin is dealing with its troublesome neighbours? No doubt Time will have plenty of opportunity to deal with these questions in the months and years to come. So will everyone eView Bloglse. THE most urgent thing to hope for is a soft landing for economies grown complacent amid perpetual sunshine and friendly faces. Large imbalances and a global credit crunch are an alarming mixture. Lars Christensen, a hawkish analyst of the region at Danske Bank in Copenhagen, notes that twitchy investors in the Baltic states and Bulgaria are already sending money market rates higher, and have driven down the value of the Romanian lei. Some early signs indicate that Santa will be kind. Credit growth is slowing. Estonia’s growth rate and property prices have dropped sharply: bad news for construction companies, but good for everyone else (and its current growth rate of 6% is still mouth-wateringly good by West European standards). But inflation remains far too high, sharply up on the year-end figure for 2006 in every country except Hungary. Higher prices for food and natural gas will make that worse, stoking the pressure on competitiveness. Second on the hope list is better treatment from rich neighbours. The extension of the Schengen passport-free travel zone to the new members of the European Union risks being the high-water mark of integration between “old” and “new” parts of the continent. It is a fine thing to be able to drive from the north of Finland to Gibraltar without showing your passport. But the danger of leaving the western Balkans stranded in a no-man’s land is growing. Slovenia’s historic presidency of the EU, which starts on January 2nd, will be a huge success if it can get membership talks started with Macedonia and unfreeze talks with Serbia, particularly on visas. The European Court’s recent decision in favour of a Latvian building company driven out of business by Swedish labour protectionism was a good start. But it is high time to end remaining labour-market restrictions and restart negotiations on free trade in services. Third would be some glimmers of hope from Russia, both in its treatment of opposition activists at home, and its neighbours. Given the Kremlin’s overwhelming domestic support and the ease with which it gets what it wants from the outside world, it is tempting to hope that it might start taking things a bit easier. Two new troubling tactics against troublemakers are the abuse of psychiatric incarceration—most recently against an opposition leader in Mari El; and the use of the draft against men of conscription age. Reports that Oleg Kozlovsky, a leader of Oborona, the main anti-Kremlin youth movement, has been conscripted despite his exempt status, are shocking given the hellishly brutal mistreatment that even apolitical conscripts can expect. Things look a little more hopeful on foreign policy: Dmitry Medvedev, at the time of writing the president-designate, seems to have no great chip on his shoulder about the West. If the Kremlin wants to show its cuddly and respectable face, then it ought to refrain from any political shenanigans in Georgia next month, and treat the Baltic states as fully fledged members of the EU rather than rebel provinces. Fourth would be new faces. It is hardly surprising that voters across the region feel jaded: the tired collection of squabbling, self-interested and ideas-free politicians are a poor advert for democracy. The growth of an economically independent and well-travelled middle class that sees the need for better government all too clearly should provide fertile soil for a new generation of competent, interesting leaders. For now, the new Polish government stands out in the political beauty contest, less because of its own charms than because the competitors are so unimpressive: sometimes weak, sometimes slippery, often both. On that note, happy new year.